There is a new upswing in India’s relations with the United Arab Emirates, home to 2.6 million-strong Indian community and New Delhi’s third largest trading partner after China and the US. Barely weeks after the successful trip of Prime Minister Narendra Modi to the Gulf state in August, UAE’s Foreign Minister Sheikh Abdulla Bin Zayed Al Nahyan visited India on September 2 and 3, imparting a fresh momentum to multilayered bilateral ties. Clean and Green – this new focus on smart living and sustainable urban space, found affirmation in India’s Prime Minister Narendra Modi’s maiden visit to the world’s zero carbon smart city in the UAE. Mr Modi, who has unfurled the dream of 100 smart cities in India, looked visibly impressed as he took a ride in a self-driven car that runs on solar powered batteries in Masdar, a 5.95 sq km strip located 17 km southeast of Abu Dhabi international airport. Mr Modi discussed urban development and next generation urban spaces with United Arab Emirates officials on August 17. He was also briefed on Masdar city’s Private Rapid Transport System. Impressed with the city, Mr Modi wrote ‘Science is Life’ in the visitor’s book at Masdar city. Masdar city project aims to turn Abu Dhabi into an international hub for renewable energy and to support the development and commercialisation of sustainable technology. The smart city concept is a key agenda of Mr Modi’s development plans. Masdar was meant to be an incubator for a new generation of Emirati green start-ups with an aim to garner investments in green energy and technology. This, in the long run, would earn Abu Dhabi significant revenue if its oil runs out. But due to the global financial crisis in 2008, Dubai’s state-owned investment company ran up a debt of USD 59 billion that left Abu Dhabi with little to invest in Masdar city. Against the backdrop of the emergence of the Islamic State as the top security threat to the region, India’s Prime Minister Narendra Modi has called for intensifying counter-terror cooperation with the United Arab Emirates, the first Gulf country he has visited after taking charge in May last year. 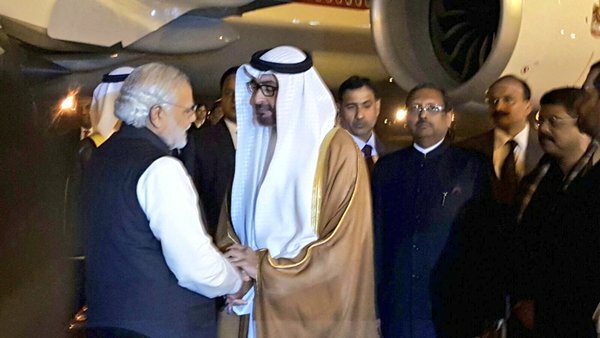 As Mr Modi arrived in the UAE on a two-day visit on August 16, the first visit by an Indian prime minister to the Gulf dynamo in 34 years, he was accorded a grand welcome and was received by none other than the Crown Prince of Abu Dhabi Sheikh Mohamed bin Zayed Al Nahyan and his five brothers. Speaking about the agenda of his visit, Mr Modi said in an in an interview to Khaleej Times that he wanted to see the UAE as India’s top partner in trade and counter-terrorism, while noting that both countries had a range of common security and strategic concerns in the region including extremism. “We have a range of common security and strategic concerns in the region, including terrorism and extremism. So India and UAE have everything to be a top priority for each other. This is the way I look at the UAE. The Gulf region is vital for India’s economic, energy and security interests,” he said. The 27th sojourn by Prime Minister Narendra Modi outside the country to United Arab Emirates August on 16-17 is significant and remarkable not only because he is the first prime minister to go to this country after Indira Gandhi’s visit 34 years ago. Nor also because he is visiting a country which contributes about 15% of the total inward remittances (USD 15.7 billion out of a total of USD 69 billion received by India from all over the world in 2014-15). Nor even for the fact that Indians constitute about 30% of the total population (2.6 million out of a total population that is a shade above 9 million, less than half the population of Delhi). The visit is exceptional because this will be the first visit by Prime Minister Modi to West Asia, to a Muslim country and to a Gulf Arab country. This is one region that Mr Modi has not visited so far, although he has straddled across hemispheres over the last 14 months of his tenure. PM Modi’s choice of UAE to be the first country of his visit in the energy-rich but troubled region is as compelling and momentous as was his choice of Bhutan to be the country for his first bilateral visit after assuming power. PM Modi is giving the same importance to UAE as he gave to India’s neighbours like Bhutan, Nepal and Bangladesh by making this a single country tour and not combining it with other countries. This also sends out a clear message that UAE occupies the same importance and relevance in India’s foreign policy matrix as its immediate neighbours. Barely a day after unfurling the tricolour at the majestic Red Fort in New Delhi, Prime Minister Narendra Modi will fly down to the United Arab Emirates (UAE) for his first visit to the energy-rich and enterprising Gulf region, home to the 7-million strong Indian diaspora. Abu Dhabi and Dubai, the two cities Mr Modi will visit on August 16 and 17, are looking to roll out the red carpet for Mr Modi, who will become the first Indian prime minister to visit the country in 34 years after Indira Gandhi. The focus will be on intensifying economic ties across the spectrum, but the show-stealer will be clearly the grand public event at Dubai International Cricket Stadium, where around 40,000 people, mostly Indians, will be all eyes and ears to see and hear the man who has carved a reputation for himself as a stage performer. In an act reminiscent of Madison Square Avenue panache, PM Modi is expected to enthrall them with his inspiring rhetoric, exhorting them to contribute their bit to the resurgence to the motherland.